There are at least eight species of owls that can be seen in South Dakota. Of these, the Eastern Screech Owl, Great Horned Owl, and the Barn Owl are year-round inhabitants of the Madison area. 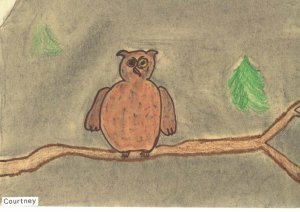 The student in my third grade class each chose one of these owls to research and draw. 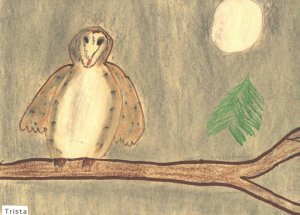 Owl Moon is a story about the special closeness between a father and his daughter as they go looking for the Great Horned Owl one bright, moonlit winter night. The little girl in the story narrates their adventures. 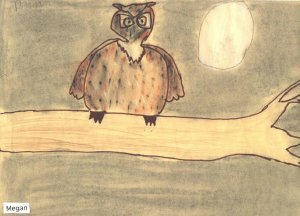 Owl Moon is a story in our reading anthology. 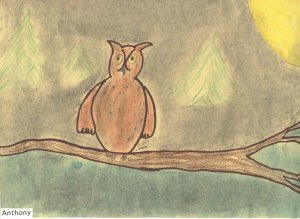 After reading the story in class, the students rewrote the story in the owl's point of view. One day I was minding my own business when I heard a girl and her dad. I was so scared I flew to a higher branch. Then the dad shined a flashlight at me. It was so bright! I told him, "Don't shine that at me." He stared at me for at least 2 minutes, or maybe even longer. I was hoping they would go home. Just then he turned off the flashlight and they went home. I flew away and went home. The Barn Owl is a type of owl that likes to get food at night. It also likes to live alone. Did you know that owls have short thick bodies, hooked beaks, also very powerful feet with very sharp claws called TALONS? The feathers on a owl are long, soft, and also very fluffy. Owls eat mostly mammals. The largest owls eat rabbits and squirrels, and the smallest owls catch mice, rats, and they even catch shrews. Did you know most owls like the Barn Owl feed on plants too? The Barn Owl will go to other places to find food if the plants don't grow or the area is to cold. The Barn Owl can be found in Madison and other places. The Barn Owl is also known as the Delicate Owl, and White Owl. The Female length is 34\40 cm, its weight is 570 g, and its wingspan is 110 g. The Male length is 32\38 cm, its wingspan is 107 cm, and its weight 470g. Did you know that the Barn Owl are easy to recognize with its heart shaped face? They live in the dark corners of barns, and this is how they got their names. 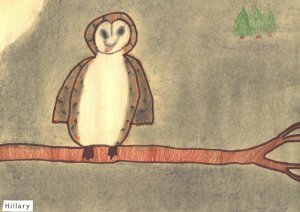 On rainy days the Barn Owl may go hungry without catching anything. Hunting is really difficult in the rain. Most owls will sit out in the rain and wait until the storm is over and wait for better weather. Barn owls are sometimes called the monkey faced owl because of its heart shaped face. The Barn owl is also known as the delicate owl. The Barn owl lives on all the continents except Antarctica. There are 10 species of barn owls. It nests in dark places in barns. Female owls lay 3 or 4 eggs. Some can lay 12 eggs and some only lay one egg. The eggs are round. The male owl is out catching food while the female is tending the eggs. It is unusual to see both parents in the nest at the same time. The female barn owl is 34-40 cm. The wingspan is 110 cm. They weigh 20 oz. The male is 32 -38 cm. The males wingspan is 107 cm. and they weigh15 oz. The male is actually smaller than the female barn owl. The males chest is all white & the females chest is speckled. The barn owl's hoot is more like a shriek. The Barn Owl is 18 inches long. It has a heart shaped face. It lives in colder regions. The common Barn Owl usually nests in a cave or hollow tree. An owl is a type of bird that usually lives alone and hunts at night. Owls can fly fairly fast. Their feathers muffle the swishing sound that most birds make when they fly. An owl can swoop down on its prey unheard. Some owls can see well enough in the day time to hunt by day as well by night. Barn owls are more nocturnal than other owls. They wait until dark before starting out to hunt, except, when the their young are hungry, then they may start their hunting at twilight. 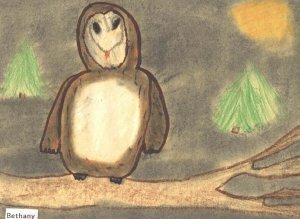 Barn owls live in dark places, like in a barn. 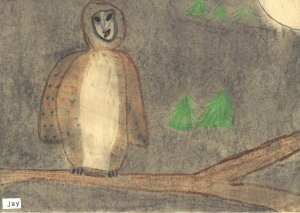 There are ten species of barn owls. They are about 46 centimeter. That's pretty small for an owl. Owls have short, thick bodies. This owl is sometimes called the monkey faced owl because it has a heart shaped face, beady eyes and amusing actions. That what makes them like those monkey. The common barn owl usually makes its nests in a cave, or in a hollow tree. It also may nest in a darker place or in a very dark barn. That's how it got it's name. 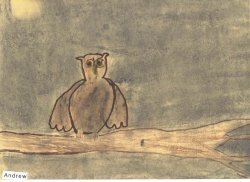 Owls are a type of bird that usually hunt at night. The owl has been named " night watch of our gardens." because it eats harmful rodents at night. Although it is a bird that kills and eats other animals, it is not known to be closely related to other bird of prey. The Great Horned Owl's only enemy is people. It is shy. It is nocturnal. It is the only bird to build nests and mate in January or February. They will nest in other bird's abandoned nests. It lays 4 to 5 eggs and in 3 to 4 weeks they have fully developed their feathers. 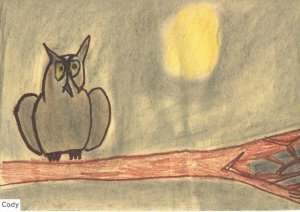 All owls have good vision at night. They are named the Great Horned Owl because they are big. The females weigh from 2 to 3 1/2 pounds and the males weigh from 3 to 5 1/2 pounds. The Great Horned Owl grows to about two feet long and is the only large owl of North America that has tufts of feathers on its head. Like others owls its heard more often than seen. It can sound like a barking dog in the distance or it makes a whoo, hoo-hoo, whoo, whoo. They live in Madison and other places. The Great Horned Owl has yellow eyes and a white throat patch. Barred on the underside, these owls can be different colors from reddish-brown, to gray, to black and white. Its stripes let it blend with forest patterns of dim light and shadow. It is such a fierce hunter that it is often compared to a tiger. Like the tiger, it hunts in the dark, and kills instantly. When it flies it does not make a sound. It uses it's eyes and ears to find food. It will always return with something. It is an accurate hunter whose powerful silent dive means certain death for any unsuspecting prey. _One cold winter night I was flying around looking for something to eat. Moles sounded really, really good! Then I saw two people, a little girl and her dad. Her dad kept saying,"Whoo-who-whoooooooo." He said it again and again and again. I finally called back, "Whoo-who-whoooooooo!" They came closer and closer. They came really, really close to me and I got scared so I flew off. They saw my shadow and followed me. Then the dad turned on his flashlight and shined it at me. I looked at them and they looked at me for a very long time. It seemed liked 200 minutes! Then they took a picture of me and I flew away. One cold, snowy night I was just looking for something to eat when a little girl and her pa came into the woods. Her pa called out, "Who- who-whoo-whooo." Actually I thought it was quite bad. Then he called it out again. I flew out of the shadows, and landed on a branch. Just then some kind of light shone on me. They stared and stared, which seemed like an hour. I stared back and wondered what are they doing. They're not supposed to be here at night. What are they going to do? Are they going to hurt me? Then Pa's voice disturbed my thinking, and he said, "time to go home." and I never saw them again. One snowy night I was flying around looking for mice. I heard whooo-whoooo-who- whooooo. I thought it was another owl. I went looking for it because it was like a help call. I heard it two more times. So I kept on flying toward the sound. It turned out to be a girl and her father going owling. Then they shined a big light on me so they could see me better. I stared at them for a few minutes. Then I flew away. They went back home. There are about ONE HUNDRED THIRTY FIVE kinds of owls. The Great Horned Owl can sound just like dogs. Another owl sound is whoo, hoo, hoo, whoo, whoo. Young Great Horned Owls can not fly until they're NINE or TEN weeks old. They grow to TWO feet (SIXTY ONE centimeters). In our area they are usually found breeding in a tree or wood lots by open fields. One cold winter night I was asleep when a crunching noise woke me up. I thought somebody must be going owling. Nobody was close to me so I just went hunting for mice, moles, shrews, and birds. I landed on a branch, and then I heard that crunching noise again. Then everything was quiet. I was very calm. You could see my shadow, and you could see the big, bright moon. Then I heard that crunching sound again. I saw a dad and a little girl. The dad made a sound,'' Whoo-whoo-whoo-whoo.'' I made the same sound, ''Whoo-whoo-whoo-whoo.'' They shined a flashlight on me. They saw me and I saw them and then I flew away. One winter night I was sitting on a tree looking at the beautiful moon when I heard feet crunching in the snow, so I flew away. Then I heard it again. Suddenly I heard a train whistle blow. It sounded like a sad, sad song. A farm dog answered the train, and a second dog joined in. I looked down and saw little gray footprints, so I flew even farther away. It was starting to get very quiet. Then they saw me, and I saw them. We stared at one another for one minute, three minutes maybe even a hundred minutes. Then I pumped my great wings, and lifted off the branch. The humans left too. I went to my tree and continued looking at the beautiful moon. It was a cold winter night when I went to look for some food. I heard an owl call. I went to see what it was. It turned out to be a girl and her father. They were going owling. I went to a safe place so they wouldn't see me. I heard a who, who, who, whooo. I answered them. I went to a place so they could take a look at me. I even flew down to let them pet me. They were nice. After that I flew away to go look for some food. The people went home. One cold winter night I was sleeping when I heard some people talking. I could see their shadow, hear the snow crunch, and hear them call out , "Who who who who whoooooooooo." They got closer and closer. I was just landing in my tree when they flashed a flashlight on me. We stared at one another for at least a minute, or maybe even three minutes. Then I flew away. The people stayed in the forest for a little longer and then went home. One winter night I was flying around in the woods searching for my friend because I couldn't sleep. I was flying around until I heard someone call to me. I called back. There were two people that called me. It was a girl and her father. I landed on a branch to get a closer look. One of them turned on something bright. It was so bright that it hurt my eyes. I decided to fly back to my house and I fell asleep. I had a wonderful dream. I slept better than ever. The Screech Owls lives in most places except the colder regions. The Screech owl lives in the woodlands. Screech owls like to spend the day in hollow trees and nest there. They often live in trees along city streets and parks. Screech owls measure about 10 inches long and are the only small owls with ear tufts. Most Screech owls have from four to six young. Screech owls may be reddish or grayish in color. They eat mostly large insects. Most owls eat their prey whole-bones, beaks, feet, and feathers. Owls often hunt at night in the same area as a hawk hunted by day. Darkness is no problem for the owl. Owl feathers are soft and fluffy so that the owl can fly silently. Screech owls may give no signs that they are around until dark. The Western Screech owl is classified as Otus asio. Typical owls account for about 135 species. The Great Horned Owl is one of them. The Great Horned Owl lives in many places throughout North America and even in South Dakota. It can be found in the forests of the eastern and northern parts of the continent, and among cliffs and canyons of the dry regions in the West. The Great Horned Owl is found in lots of habitats. In Minnesota they are usually found breeding in stands of trees or wood lots by open fields in agricultural areas. They can be found in cities as well, in parks, residential areas, and industrial developments. It grows 2 feet long and is the only large owl of North America that has tufts of feathers on its head. It sounds like a barking dog in the distance. The Great Horned Owl chooses old crow or hawk nests in which to lay its eggs. Both males and females sit on the eggs at different times. The young Great Horned Owls cannot fly until they are 9 to 10 weeks old. The Great Horned Owl feeds on a wide variety of prey. These include waterfowl, rabbits, squirrels, marsh birds, and rodents. Most owls - both male and female- match the dull brown, daytime camouflage of this Great Horned Owl. Smaller birds that spot a resting owl may mob it, drawing attention to its hiding place. Other small animals are warned of the nearby owl. A Great Horned Owl keeps its food supply away from competitors by defending its territory. One of the smallest owls is the Screech Owl. They are only 10 inches long and are the only small owls with ear tufts. Their color is a rusty-red, brown, and gray. They have yellow eyes. Screech owls eat mostly large insects. Screech owls like to spend the day in hollow trees and to nest there. They like to use the trees along city streets and in parks. They may give no sign that they are around until night. Then they give weird trembling calls and whistles that run up and down the musical scale. Screech owls are the best known small owls. They are about 7 to 10 inches long. They are the only small owls with ear tufts. They are nocturnal. They have piercing yellow eyes. You can tell if it is a Eastern Screech Owls by the color of their bills. Eastern Screech Owl's bills are gray and green and the Western Screech Owl's bills are black. Owls have twice as many vertebrae as we do, so their head can turn almost all the way around. This lets them look in all directions. Owls have such big eyes there is no room for muscles to move their eyes. That's why it's important that their head can turn all the way around. The wingspan is about 18 to 24 inches. They weight 4 to 6 ounces. They live in the wild for 3 to 8 years. They usually live in captivity 12 years. They eat mostly large insects. They eat animals like mice, rats, moles, shrews, flying squirrels, chipmunks, bats, songbirds, rock doves, bobwhites, ruffed grouse, other screech owls, snakes, lizards, frogs, toads, salamanders, small fish, snails, crayfish, spiders, scorpions, millipedes, earthworms, moths, and grasshoppers. Most birds of pray hunt and kill other animals to eat. The Eastern Screech Owl lives in woods of the Rocky Mountains, from northern Canada to Mexico. Eastern Screech Owls may be reddish or grayish in color. They range throughout the entire eastern half of the United States include Madison S.D. Reddish Screech Owls are more common in the southern states. They live in woods or suburbs with large shade trees. They like to spend the day in hollow trees and nest there. They will live in a birdhouse if it has a 3 inch opening. None of North America owls build nests. The eastern Screech Owl nests in cavities and likes birdhouse. Most of them have 4 to 6 babies at a time. Owl are among the most exciting and interesting of all birds and include species such as eagles, hawks, and buzzards. The most interesting thing I learned about screech owls was all the things they eat.